Casa de Living in Grace been infiltrated by a foreign species of bacterial entities. Germs are everywhere in the form of a walking, hacking, snotting, grouchy 14 year old male. I have no idea what they've done with my son. We've looked high and low, but cannot find him anywhere. We truly believe that the infiltrators have the ability to clone the human form and completely annihilate it's prototype. I'm locked in the bunker, to avoid being attacked. Should I be exposed, I would be taken to the local sick bay and placed on quarantine. My immune system is weak against the perils of assimilation by the bacterial invaders. Send reinforcements. Our Nyquil warriors are tired and losing the battle to hold the line. Please, if anyone is out there... we need help! And the winner is "Need a Nap2". Email me at jkbach(at)gmail.com with your address, and I will have your CD mailed right out to you! Yep! I'm on our new laptop! On Monday, we received a box from a wonderful reader of ye ole' blog, She had contacted us after reading my guest post over at Rocks in my Dryer's place. In her email, she blew us away by offering to send us a "retired" laptop she had access to if we were interested. Those of you who have been around here long enough know that John works from home, and requires Internet access to complete his daily functions. Because of this, he had to make a choice every time I had a doctor's appointment or a stay in the hospital- did he say home and miss being there with me, or not work and lose income. What a HUGE HUGE HUGE blessing you have been to us. So, it would appear that I now have no excuse not to stay current on all the happenings with my peeps! Woot!! And lastly, for everyone who has been praying about my blood work. We drew blood yesterday, and the results are in! Our biggest issue was my BUN (the level of toxins in my blood). At surgery three weeks ago, it was over 180. Lat week, over 140. Today? Our goal is to get below 60, but for the moment it means no surgery, no hemo. I see the doctor again on the 9th, and hope to be taken off bedrest then. I did get out yesterday and go to the store with Kati, and it felt really good. I paid for it all night, and slept it off most of today. But, I look at it as baby steps. It took me year or more to get like this, It will take awhile to get better. But, as I was telling Shannon today, I have hope now And hope will get me farther than anything. Our goal is to talk to the doctor on the 9th about finalizing things with Legacy Emmanuel for transplant consideration. My numbers had to be in line for them to even look at me- let alone consider me for their High PRA protocol program. So, that is the prize we have our eyes on. Even if it means I am stuck in bed until then. But, I'll be around now and online, thanks to a blessing from a sister in Christ. Lookie Lookie! It's a Giveaway!!! Who doesn't love FREE MUSIC!! There. Now dontcha all feel soooo much better. 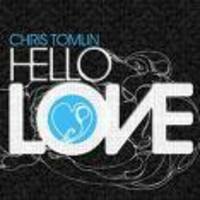 The great news is that Chris Tomlin has released a brand spankin' new album, and I have a copy to give away! "Following his 2006 RIAA Gold-certified record, See the Morning, Tomlin's latest project communicates what he describes as the "need to introduce ourselves to love again." Produced by Ed Cash (Steven Curtis Chapman, Amy Grant, Bebo Norman), Hello Love endeavors to give voice to the Church to worship their Creator. This is evident throughout the album on songs like "Love," "God of This City," "Sing, Sing, Sing," and "I Will Rise" to name a few. Tomlin explains, "With each new record, I continue to strive to create songs that will help people voice their worship to God. Worship is a massive word with a very broad scope, but in the end, it is very simple. It is love! It's our response in love to our great God who loved us first." Pop the CD in your later to gain access to an exclusive Hello Love Tour concert ticket offer! The tour dates currently run from January 22, 2009 through April 10, 2009. I've been enjoying this CD since I received my copy a couple of weeks ago, and know you will be blessed so much by the music. My fav is Love, which features Chris singing along with the Watoto Christian Choir. So, you're wondering ... "Hey Kelli, how do I enter to win such a fab CD?" Great music is so amazing, and I need to update my current collection o'songs. To enter, leave me a comment with your Top 3 current fav Christian CD's (or songs). I mean, we're talking gospel, worship, anything from TobyMac to Travis Cottrell. Whatever makes your soul fly. And remember, leave me a way to get in touch with you should you be the winner.Comments will close Friday, August 26 at midnight PT. I'm. Off. To. Take. A. Shower. for the first time in two weeks. Yesterday started off well. I Was out of bed for awhile and washed my hair for the first time since surgery. We had to go to the Dr. for blood work, and then ran a few errands. Although I slept in the car abit, over all i felt ok.
To get in to the SUV, I have to swing my left leg up then pull myself in. So, I swung the left leg, and the right folded under me. Down I went. It took awhile, and a lot of effort on John's part. to get me on my feet again. In my brain, I Was willing my leg to push me upwards, but nothing happened. Once we got home. john was getting ready to help me up the two stairs the lead onto the front porch. In talking t th Dr. on call, he patiently explained the physiology of what happened. And why. Seems I'm fighting several battles. The altitude here 9over 3700 ft above sea level) means less oxygen. So, alittle anemia goes a long way. This will cause my blood pressure to plummet, and blah blah blah about some other stuff I don't remember, but the bottom line is that (coupled with the fact that I'm still dehydrated from surgery, and my BUN is high) caused the issue with my legs. So, lucky me. I'm now on 16 hours of dialysis a day (until Monday) and full, complete, utter bed rest. I lost my 2 hours of free time. Except potty breaks. So, I may not be around much in the next few days. The good news, though, is that he pulled the results from my labs yesterday/ Although my BUN is still dangerous high, it has come down 40 points since pre-surgery. I have until Monday now to come down more and dodge the hemo bullet. What going on with all of you? If you would, leave me a comment with some stories of how you're all doing, and if there is anything I can be praying about for you. I can't think of a better way to pass the time. The blood work from Thursday is back and it stinks. Really bad. It appears my loss of appetite and inability to keep anything down (for the most part) is due to the high BUN in my system. BUN is the level of toxins in your system, that your kidneys normally clear out. Mine is over 12. Normal for a dialysis patient in around 8. Blood work was drawn on Thursday, when I Had only dialyzed one night after taking a week of post-surgery. Now that I've a few more sessions under my belt, things should be getting better. - If I have to go to hemo, that God will provide reliable transportation. Right now, we are borrowing my mom's Honda so John can work on my car. But it needs so much more than we can afford right now, and buying another car- even a good used one- is not in our budget right now. We looked, but I don't see it happening. Hemo means driving 40 minutes to two each way three times a week. And the snows are going to start any time. - Peace for all of us. This would be a place none of us want to go. - Jonathan's foot, and the ability to get it taken care of without insurance. Or that the approval for their new insurance will come through quickly and cover it as a "pre-existing" condition". Gee, I think thats all. Sigh. Thank you guys for your prayers. Remind me again, Sunday is a day of what? Continuing to bed rest. Blah blah blah. Can't seem to keep my eyes open today for some reason, but I'm sure it will pass. Incisions are healing well, don't seem to be getting more infected. Hallelujah. Tomorrow we will have blood drawn again, and there is a chance that we will still go forward with surgery t place the heme catheter. My BUN was 12 on Tuesday, which is Way Too High. Dangerously high, actually. So, tomorrow's blood test will show if we are making progress with the minimalistic dialysis amounts we are doing. As Scarlett O'Hara said "I'll think about that tomorrow." John has spent the better part of the afternoon at the ER with Jonathan. His foot had been bothering him for the last couple of days, so we finally decided to take him in today. No reason why or how, it just ... is. So, he is on his way home in a boot and a cast with a referral to the ortho. Did I mention that their insurance is not covering this ortho appt? We are in the process of moving their insurance to the local Oregon plan, since we could not afford to carry them our plan. Their insurance is great is we were in, say, Arizona. So lord- it's up to you on this one. You've gotten us this far, I know you'll help us through this little bump. That's the roundup from Camp Living In Grace for today. Tune in tomorrow where I hope that all news will be boring, mundane, old news. PS: A big THANK YOU to Gillian, Theresa and Lynn who have provided dinner for our family these last few nights. What a sheer blessing you ladies and your families have been these last few days. Thank you a million times over is not close to expressing how we feel. I talked to the covering Dr. today. My Dr. is at a training session for a week, in the midst of my personal medical crisis- I mean, seriously. But Dr. Covering is my original Dr. with this group, so I'm pleased as punch he's covering my care this week. Except he called and put me on bedrest for another week. We had a huge breakthrough last night in regards to the post-surgical case of constipation. I do believe it was akin to birthing a child. Painful for hours, then Boom! It's out and all over with. Of course, then came the hours of the medications to create such 'a child' at work. Let's just it was not the kind of "family time" I envisioned last night. At 4am, 6:30am, at 8am. I think you get the picture of my day today. It's been tricky considering I cannot actually shower. Thank goodness for hand held shower heads. At we will leave it at that. Kati is into fashion design, as most of you know. Her new goal in life is to attend the Academy of Art and major in fashion design. Watch for her on Project Runway in a couple years. Seriously. Her should hear her critique the contestants. She's pretty darn good. Well. Her high school is a DECA member, which she is fully involved in this year. She's also taking Theatre Arts. Combine the two, and she's been asked to design the customers for the fall production of "Emma" for the drama department. Needless to say, she is beside herself with glee! This will all go into her portfolio when it comes time to apply for the Academy of Art , so we are thrilled as well! The school has a budgeted seamstress to do the majority of the sewing, but Kati will manage the design of costumes, last minute assistance and accessories. This will be great experience for her in regards to her finals project for DECA, which coudl go all the way to the Internationals level. We're so darn proud of her. Well, back to bed rest for me. Time to dialyze for 12 hours. 2:24am, and I can't sleep. We went to dialysis clinic Thursday afternoon (only the second time out of the house since the Great Hemorrhage in the Target Parking Lot of 2008). We changed dressings on all of the incisions (man, oh man have I got alot of scars now), drew some blood. It looks like I have two infections starting, which we will need to watch. The hope is that both are external only, and the underlying incisions are healed enough to where any bacteria stays on the surface and not in the peritoneum. Oh, and no showers/baths for at least two more weeks. Good news all around. Yeah buddy. We enjoyed a scrumptious pizza dinner tonight courtesy of a sweet reader who ordered it delivered to us, from across the country! We had not yet discovered this little place in our small village, but it was great food! And you should have seen the salad. It had cukes, mushrooms, whole baby corn, baby carrots, sunflower seeds ... all kinds of yummy stuff. Considering I Can only eat a couple bites at a sitting, the salad is going to last me a few days. And I will enjoy every. single. minute. of. it. This is the same sweetness that has offered to coordinate meal deliveries for us through a website scheduler. Thank you again and again, sweet friend! You don't know the blessing it was tonight. OK. That passing out feeling is taking over, so I'm off to lie down again. And catch up on the DVR recordings.